In Washington, D.C., ethanol production fell to 967,000 barrels per day (b/d), or 40.6 million gallons per day, which was down 45,000 b/d (4.4%) from the previous week, according to government data released and analyzed by the Renewable Fuels Association. This was the lowest weekly production level since October 2017. The four-week average ethanol production rate declined to 1.015 million b/d, the lowest since April 2018, equivalent to an annualized rate of 15.56 billion gallons. Weekly production was 8.5% lower than the level a year ago, while the four-week average was 3.8% lower. Stocks of ethanol receded to 23.9 million barrels. Stocks were relatively steady in most regions but fell in the Gulf Coast, reversing an increase the previous week. Average weekly gasoline supplied to the market fell back to 9.073 million b/d (381.1 million gallons per day), equivalent to 139.09 billion gallons annualized, after surging the prior week. Still, the four-week average and year-to-date average remain more than 1% above year-ago levels. Refiner/blender net inputs of ethanol increased 2.0% to 887,000 b/d—equivalent to 13.60 billion gallons annualized. 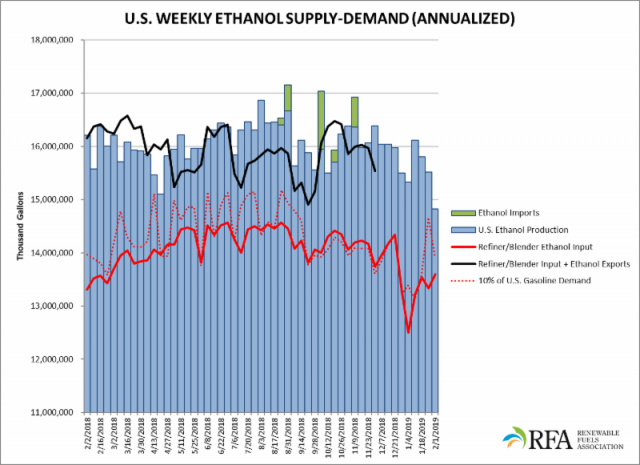 Ethanol blending remains higher on a weekly (2.2%) and four-week-average (2.7%) basis than year-ago levels. Still, net inputs of ethanol have accounted for less than 10% of gasoline product supplied for four of the last five weeks. Expressed as a percentage of daily gasoline demand, daily ethanol production ticked up to 10.66%.